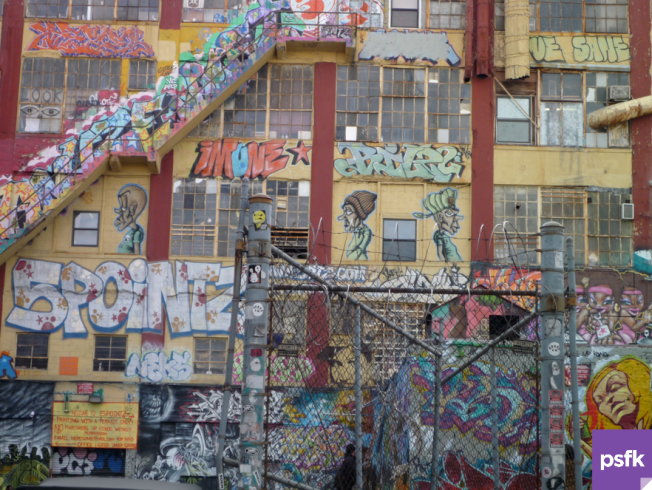 At 5 Pointz, artists have reclaimed the walls. With Poster Boy's recent arrest at a SoHo art party and Shepard Fairey's in Boston, street artists around the city might be glancing over their shoulders a bit more than usual these days. But that's not the case at an artist community up in Long Island City in Queens, where about 90 artists call an old commercial factory home with little fear of the NYPD graffiti task force knocking down their doors. On the outside of their building, the artists and others from around the world have contributed their talents, with art "painted by permit," where the "placement of each piece is assigned by Meres One, curator of 5 Pointz [as the building is known] and fellow street artist." But for artists around the city hoping to escape the heat and join with their counterparts in Queens, 5 Pointz is currently closed for general painting. But no worries, as it will open again this spring. A graphic on their site says "early May," so everybody just chill out and lay low for a while.